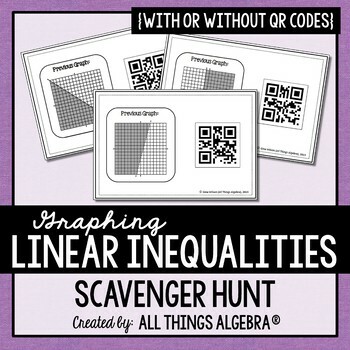 Graphing Linear Inequalities Scavenger Hunt: Students will practice graphing linear inequalities in standard form through this scavenger hunt activity. 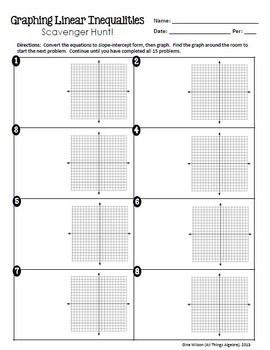 Just print and scatter the 15 problems around the room and distribute the recording worksheet to each student. 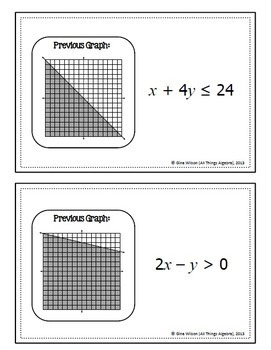 Pair students up and assign them a starting problem. 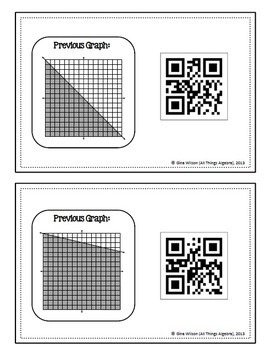 They scan the code to reveal the problem, convert to slope-intercept form, then graph on their worksheet. Then, they look for their graph around the room to start the next problem. They continue doing this until they have looped through all 15 problems. A non-QR code version is included as well. I included very similar problems so that they must have a solid understanding of slope and y-intercept. I also included vertical and horizontal lines, and similar problems like y < -x and y < -1.